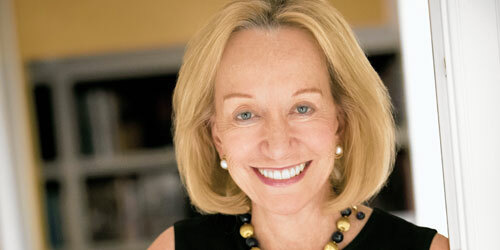 When slipping into the past she loves so much, renowned historian Doris Kearns Goodwin is fond of quoting lines from Emily Dickinson: There is no Frigate like a Book / to take us Lands away. Of Goodwin it could be said that there is no frigate like a biography to sail us through the deep, rich currents of American history. She has launched a fleet of numerous best-selling biographies to prove it: The Bully Pulpit: Theodore Roosevelt, William Howard Taft, and the Golden Age of Journalism; Team of Rivals: The Political Genius of Abraham Lincoln (on which the 2012 movie Lincoln was based); the Pulitzer Prize-honored No Ordinary Time: Franklin and Eleanor Roosevelt: The Home Front in World War II; Wait Till Next Year, Lyndon Johnson and the American Dream; and The Fitzgeralds and the Kennedys. She shares her insights about the lives and politics of our country’s “large figures” – past and present – in “Leadership Lessons of History: Doris Kearns Goodwin on the American Presidents” during her appearance Wednesday (April 15) as part of the 2015 Broward College Speaker Series, co-sponsored by City & Shore Magazine and presented at the Broward Center for the Performing Arts in Fort Lauderdale. The 72-year-old, Brooklyn-born Goodwin took her first swing at history as a young girl, when her father taught her to keep score of baseball games so she could run down the “history” of that afternoon’s game when he arrived home from work. Which is exactly what Goodwin has been doing for decades, writing one best-selling frigate of history after another.